GhostBed Flex Mattress Review - A Cool Hybrid? 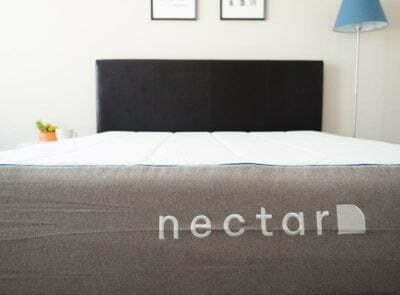 Home » GhostBed Flex Mattress Review – A Cool Hybrid? So when I heard about the GhostBed Flex, I was very excited to try it out. Unlike the original GhostBed, the Flex is a hybrid mattress with gel memory foam and high-grade support coils. Having reviewed the original GhostBed and many other hybrid mattresses, I was interested to see how the Flex would compare. Is it a good match for you? Read on for my full review. The GhostBed Flex is a hybrid mattress with a great balance of comfort and support. 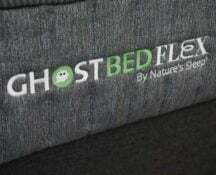 Back sleepers and side sleepers should find what they need on the GhostBed Flex. You sleep with a partner. If you’re looking for a mattress for couples, this should be a good pick. It handles motion transfer very well, so you shouldn’t feel your partner moving around too much. 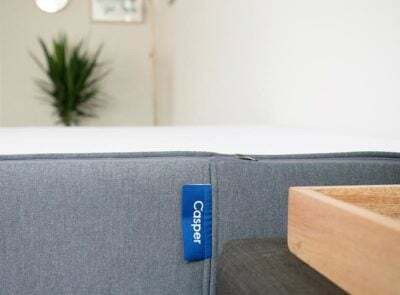 In addition, the edge support is top-notch, so you can sleep near the edge of the bed and utilize the full size of the mattress. You are a back or side sleeper. With its hybrid design, the Flex has a great balance of support and comfort. The coils provide a good amount of support, while the top layer conforms to the shape of your body. This is great for back sleepers. The top layer also provides nice pressure relief, making it a good option for side sleepers. You are a hot sleeper. If you often overheat while you sleep, the Flex should be a good option. 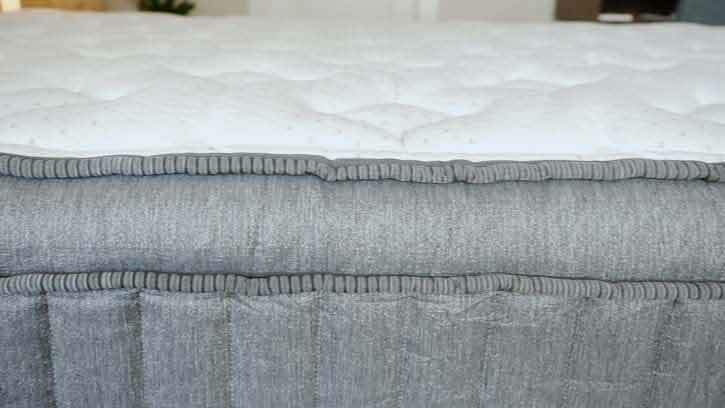 The coils promote airflow throughout the mattress and the gel memory foam dissipates heat. You shouldn’t be sleeping hot on this mattress. You want a softer or firmer mattress. In my experience, the Flex felt like a 6.5/10, or right down the middle in terms of firmness. 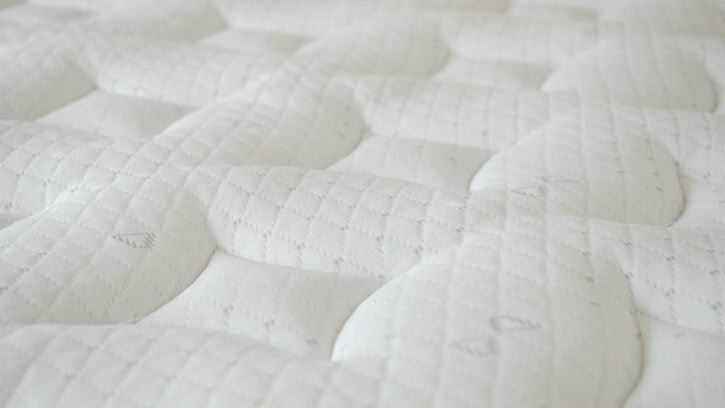 If you want a mattress that is very soft or very firm, you might need to look elsewhere. You are a stomach sleeper. If you sleep primarily on your stomach, the Flex might not be the best choice for you. It might not be firm enough to give you the support you need when you’re stomach sleeping. Because of this, you could bow in at the hips, which throws your spine out of alignment. Stomach sleepers should probably look for a firmer mattress. You want an innerspring or memory foam mattress. 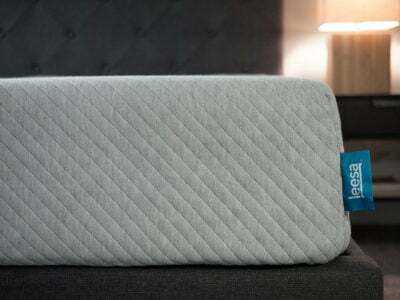 The GhostBed Flex is a hybrid mattress that incorporates both memory foam and coils. This construction is not for everyone; if you want a pure memory foam mattress or spring mattress, this might not be the mattress for you. The top is a cooling cover. Below this, there is 1” of cooling fiber. Then you have two 1” layers of gel memory foam. This is followed by 1” of Ghost Flex Soft transition foam. Next, there are 8” of individually-wrapped and reinforced support coils. Finally, there is a 1” layer of high-density support foam. The GhostBed Flex is made in the USA. The cover is cool to the touch, the foam dissipates heat, and the coils allow for airflow. You shouldn’t be sleeping hot on the GhostBed Flex. The layers of gel memory foam have that classic memory foam feel. The material is very slow to respond and has little bounce. The pocketed coils are very supportive. They should be able to support even heavier weights. Larger people should feel supported on the GhostBed Flex. The hybrid construction gives this mattress a good balance of comfort and support. The comfort layer is 4” thick and gives nice pressure relief, and the pocketed coils support you while contouring to the curves of your body. This should be a durable mattress as well. The pocketed coils mean this should be longer-lasting and stand up to years of use. How Does The Flex Compare To The Original GhostBed Mattress? If you are considering the GhostBed Flex mattress, you might want to know how it compares to the original GhostBed mattress. First and most notably, their constructions are very different. The GhostBed Flex is a hybrid mattress with gel memory foam and individually-wrapped coils. The original GhostBed is an all-foam mattress with latex foam over gel memory foam. Additionally, the GhostBed Flex is softer than the original GhostBed. The Flex felt like a 6.5/10 to me in terms of firmness, while the GhostBed felt like a 7.5/10. Because it’s a softer mattress, the GhostBed Flex is a better fit for side sleepers. I personally felt better pressure relief on the Flex. Also, while both mattresses should be good for back sleepers, the Flex should be a bit better. It allows the hips to sink in a bit more. Stomach sleepers will most likely prefer the GhostBed mattress. Finally, the GhostBed Flex does cost more than the original GhostBed. It has a more complex construction and a great balance of comfort and support. You should get more out of the Flex, but you are also going to pay more. 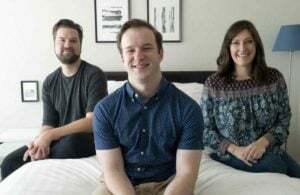 Read the original GhostBed mattress review. The GhostBed Flex felt like a 6.5/10 in terms of firmness. You have a soft comfort layer over some firmer, more supportive coils. Combined, this gives the mattress a medium firmness. While back sleeping on the GhostBed Flex, I feel very nice. The individually-wrapped coils support me while the top layers conform to the shape of my body. When I move to my side, I feel good pressure relief. 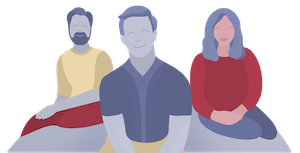 There are 4″ of comfort material, so I sink into the mattress and feel almost no pressure on my shoulders and hips. When I’m on my stomach, I could definitely use some more support. The mattress is too soft for me in this position, and I think most people will have the same experience. The GhostBed Flex has a hybrid feel with some of that classic memory foam feel on top. The gel memory foam isn’t very quick to respond and has almost no bounce. That being said, I didn’t have trouble moving around on the mattress. Overall, you get the feeling of memory foam and coils in one mattress. 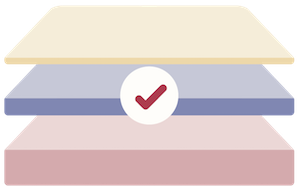 The GhostBed Flex has two layers of gel memory foam in its comfort layer. Because of this, I expected it to handle motion transfer well. I put a glass of water on the mattress and pushed into the surrounding area. The water was barely disturbed. Also, I laid down and asked Marten to move around on the other side of the mattress to mimic the movements your partner might make at night. When Marten moved around, I barely felt any of his movements transfer to my side of the bed. This makes me think it could be a good mattress for couples. The GhostBed Flex is a hybrid mattress with a reinforced edge. The coils are actually firmer toward the edge of the mattress. While sitting down on the edge of the mattress, I felt very secure, and the mattress did not collapse. In addition, when I laid down near the edge of the mattress, I did not feel like I was going to roll off the edge. All in all, the GhostBed has solid edge support. Joe said the mattress felt like a 6.5/10. I thought it was closer to a 7/10. As a larger person, I am pressing further into the mattress than Joe did. Because of this, I am feeling some more firmness. Sleeping on my back, I feel fantastic. My hips sink in just the right amount, and the top layer is supporting my lumbar area. I feel really great support in this position. When I move to my side, I am feeling a bit of pressure on my shoulders and hips. The mattress is not the best match for me when I am on my side. Finally, when I’m on my stomach, the mattress is too soft for me. If you are a heavier back sleeper, this is a great option. If you are a heavier side or stomach sleeper, you might want to look elsewhere. Marten agreed that the mattress is a good match for back sleepers and not the best match for stomach sleepers. Unlike me, he found the mattress to be too firm when he was on his side. As he said, heavier side sleepers might want to look at a different mattress. 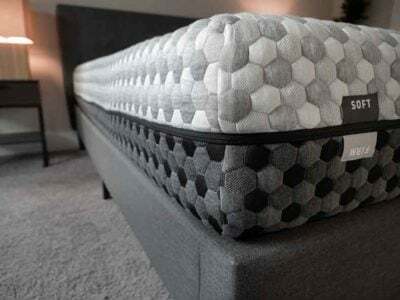 The GhostBed Flex is a bed-in-a-box mattress, which means it will come compressed and shipped straight to you. You will want to begin by removing the rolled up GhostBed from its box. Then, preferably with another person’s assistance, position the roll on your bed. Carefully cut the away the first layers of plastic until the still-compact mattress can be laid down flat. Then, pierce through the final layer of plastic and the GhostBed Flex will quickly expand. Simply clear away the excess plastic and allow your mattress to breathe and fully expand. What Makes The Flex Stand Out? The Flex has a nice balance of comfort and support. It features the pressure relief of foam and the support of coils. It is a great option for most back and side sleepers (although heavier side sleepers may feel that it’s too firm). The mattress is breathable and should be a cooler-sleeping mattress. The GhostBed Flex handles motion transfer well and could be a good option for couples. The GhostBed Flex has a lot to offer. While it does cost more than the original mattress, it should be a great investment. Most back sleepers, side sleepers, and hot sleepers should find what they need on the Flex. However, stomach sleepers or those who want a very firm or very soft mattress might want to look elsewhere. The Flex comes with a 101-night sleep trial, 25-year warranty, and free shipping. Financing is also available.